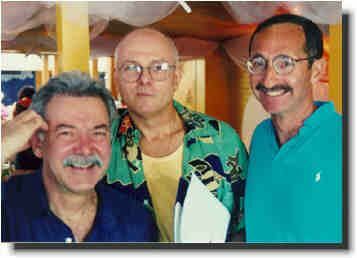 Barton Sheffield, my friend for some 28 years, has been my mentor in many things, but most of all in cooking. It is a mutual passion that we share, and no time is spent together when its joys and sorrows are not discussed. Here are few recipes that accompany his story. So as you read below - you will have the elements of what he would call "a simple peasant meal." This is the first thing I think I ever saw Barton cook. Whether the recipe came from his hand or not, I don't know. What I do know is that epitomizes his style. This is an expandable recipe. Multiply all the ingredients, with the exception of the olive oil (which you will have to adjust) by the number of people you are serving, or how abundant you might want the servings to be. Heat the olive oil in a cast iron skillet over medium heat, and then add the garlic. Sauté the garlic until soft and browned, remove and discard. Sauté the zucchini until they just begin to soften, and then add the julliened green onion, and cook until they begin to soften as well. Season with salt and pepper to taste, and serve. Barton served this particular dish regularly at his shared apartment on Locust Street in Philadelphia. 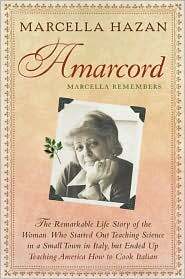 Later I learned that it is a Marcella Hazan recipe (The Classic Italian Cookbook), which I also began to use. It's simple - but makes for an elegant meal. Heat the olive oil in a cast iron skillet over high heat, and then begin to sauté the steaks about 3-4 minutes a side. When the steaks are done, remove them to a heated plate or platter and season to taste with salt and ground pepper. Remove all the fat from the skillet excepting a scant 2 tablespoons. Making certain that the heat is again high, deglaze the pan by adding the two wines and scraping the bottom of the pan. Then add the garlic and fennel seed and stir to combine. Next add the tomato paste - water mixture, and the red pepper flakes and stir again. Cook this mixture until it thickens, about one minute. When the sauce is ready, return the steaks to the same pan and continue to cook for a couple of minutes each side. Turn the steaks frequently, so that they take in the sauce. Serve immediately with the parsley as a garnish. This is from the last time that I saw Barton. It was served to him in some restaurant in Washington DC, and in his usual style Barton took the idea home and made it his own. 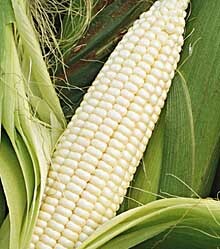 6 ears of white corn, the kernels cut from the cob. Heat the fat in a soup pan and add the onion, cooking and stirring until translucent. Add the milk along with the corn cobs, and bring the milk to the boiling point. Add the potatoes and over the pot and turn it to low until the potatoes are cooked, about fifteen minutes. Remove the cobs and add the corn kernels. Season with the salt and pepper and simmer for an additional five minutes. Just before serving add the additional butter. Place a cast iron skillet, large enough to hold all the fish (you may need to use two) into a 500º oven. Cut fish into six servings and place on plate with 2 tablespoons of the olive oil so that the fish is coated on all sides with the oil. Season with the salt and pepper. In another plate, place the cornmeal, and coat the fish pieces with the cornmeal. Set aside on the plate. Remove the pre-heated skillet, and place the pieces of fish in the skillet, and return the skillet to the oven for five minutes. When the timer rings, take out the skillet, turn the fish, and return the skillet for an additional five minutes. Meanwhile, prepare six large soup plates, placing one cup of the chowder in each plate. When the fish is done, remove from the oven, and place a piece of the fish in the center of each soup plate. Garnish with the chopped parsley. This is one of the first tricks that Barton taught me. I have used it consistently since then, and have shared this recipe with many others. The measurements for lemon juice, or one could use vinegar, are to taste. Barton likes his salads mouth-puckeringly vinegary. 2 or 3 grinds of sea salt, or to taste. 1/4 cup lemon juice, or to taste. 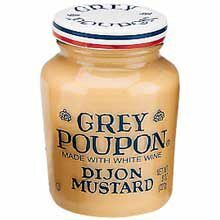 Place all of the ingredients in the Grey Poupon jar, shake, and serve.